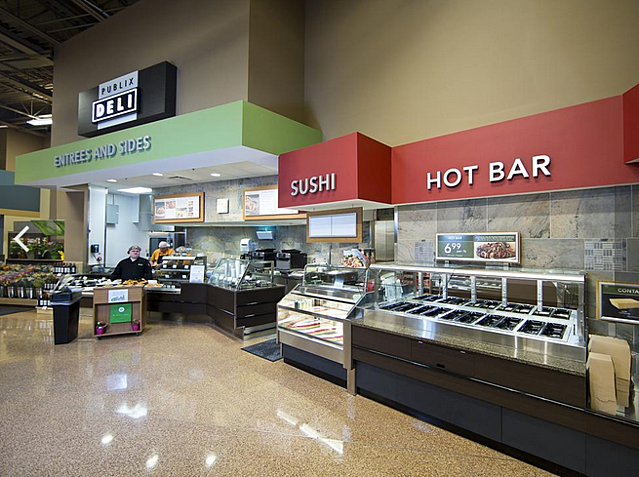 Publix Super Markets Inc. has opened a new store in North Carolina that's as much a foodie experience as it is a grocery store. The store in Winston-Salem, N.C., opened on May 11. It is a hybrid store, blending the grocer's GreenWise concept with a traditional grocery store. North Carolina is a major focus for the Lakeland-based grocer, CEO Todd Jones previously told sister paper Tampa Bay Business Journal. While that store represents 140 new jobs, each new store also represents job growth at the Lakeland headquarters. Publix has 1,110 stores in the Southeast, including being one of the most dominant grocery chains in Orlando. At 53,000 square feet, the new North Carolina store is one of the grocer's largest and includes an expanded prepared foods selection and a deli that carries more than 200 artisan cheeses and staffs a certified cheese specialist. This is an excerpt from an article posted on BizJournals.com. For complete article, click here.